One of the great new commercial features of version 1.15 of the Z1 Analyzer is the ability to import external data. This lets you use all the great features of the Z1 Analyzer to view data generated from other sources, such as real world cars. In addition that data can then be compared against data generated in a sim as well. We've just released an update to the Z1 Analyzer. This new version, 1.15.2, fixes a bug that could have caused the Analyzer to crash when importing external data. We've also added a new YouTube link to a video explaining how the import external data process works. Version 1.15 of the Z1 Analyzer is now available! This latest version has lots of improvements as well as new features. The big one is the ability for commercial users to import data from external sources! 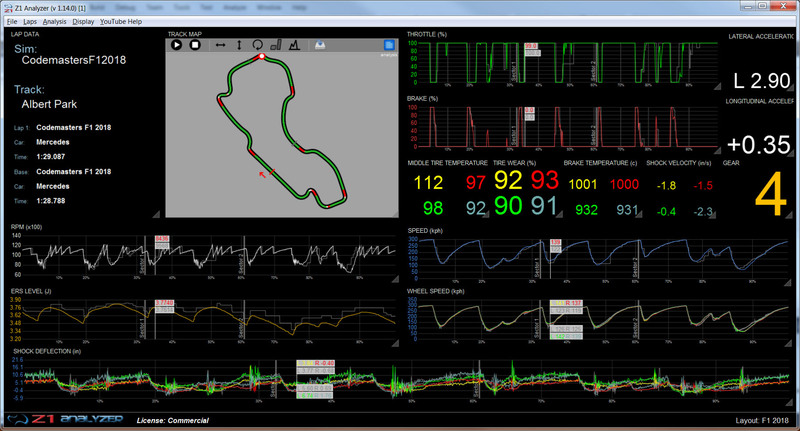 In addition you can now compare laps from different sims or real life data against each other. So if you want to compare iRacing and Assetto Corsa, or your real life track day against a sim, you can do so! The new Import External Data dialog. The updated finish line graphic makes it easier to identify the S/F line on track maps. You can now choose the colors you want to use for the throttle/brake overlays. The Ride Height analysis has been updated to allow for side-by-side displays, and improved graphics. The Status Bar now displays the car, driver and time info for the loaded laps. * There is a new commercial feature for importing external data from csv files. This data is converted into zod2 files which can then be read by the Z1 Analyzer. This feature is available under File->Import External Data, or CTRL-I for a keyboard shortcut. The dialog has 3 sections. The first is where you select the file you want to import. This must be csv file. It should contain data from one or more laps. Click the Browse button to open a file dialog and then select the file through that dialog. After you select the file, the first 50 rows form the file will be displayed in the table in section 3. After selecting the file you need to fill out the items in section 2. You can type these in manually or you can right click on the cell in the section 3 table that contains the appropriate information and then select the action from the popup menu. 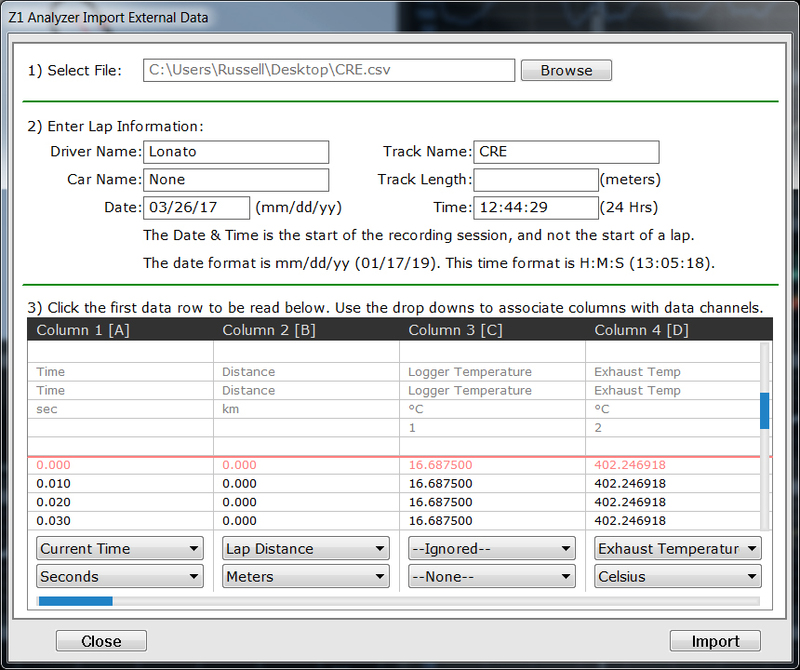 For example most CSV file from other data sources will contains the track, driver and car name in the first few rows. If you right click on the driver name and choose 'Set as Driver Name' from the menu that cell's data will be placed in the Driver Name text field of the second section. The track length is the only optional field in section 2. If you do not enter a value here then one of the columns from the CSV file must be the 'Lap Distance' data channel. After filling out section 2, you should specify the various data channels and units for all appropriate columns in the section 3 table. You can scroll this table using the blue scroll bars, both vertically and horizontally. You can also use the mouse wheel to scroll vertically. For every column you want to import, you need to select the appropriate data channel from the drop down. Any column marked as 'Ignored' will not be imported. The following data channels are the minimum that must be specified: Current Time, Lap Percent or Lap Distance. Latitude, Longitude, and Altitude are highly recommended. If they are not supplied then a circle will be generated as the track map. All others are optional. Of course the more you specify the more data you will have. Each data channel has specific units associated with it. After you choose the data channel from the top drop down, the drop down underneath will update itself with the available units for that data channel. Make sure the selected units match what is contained in your source csv file. For example if you have selected 'Lap Distance' and your CSV file has recorded lap distance in kilometers, then you'll need to set the units drop down for that column to 'Kilometers'. The final step is to specify which row contains the first row of data. Left click on whichever row this is. That row will be highlighted and have a line draw above it. Only data from this row downwards will be imported. Click the Import button to proceed. If you have not specified a track length, then the file will first be scanned to determine the length of the track. Afterwards it will be scanned again to convert the data into a zod2 file format. The file will be stored in Documents\Z1Analyzer\ExternalData\Telemetry. You only need to do the import one time for each CSV file. You will receive a message once the import is finished altering you that it has completed. You will also be asked if you would like to add the laps to the Analyzer's list of available laps. You will need to do this to open them in the Analyzer. Click Yes if you would like to do so at this time. If you click No, you can always perform a Lap Scan at a later time to add the laps to the Analyzer's list of available laps. * You can now open laps from the same track from different sims. Both tracks have to have the same name for this to work. This is intended to allow you to open a lap from a sim track and compare it to a lap from an external data file (real world) track. The name of the sim and the track map data will be taken from the main lap (and not the base lap). * When exiting the Lap Scan dialog you will be prompted if you would like to open a lap. Answering Yes will immediately open the Lap Selection dialog, removing the step of having to choose it from the menus. * The Ride Height Analysis screen has been updated to use the improved rendering engine that is used on the other analysis screens. 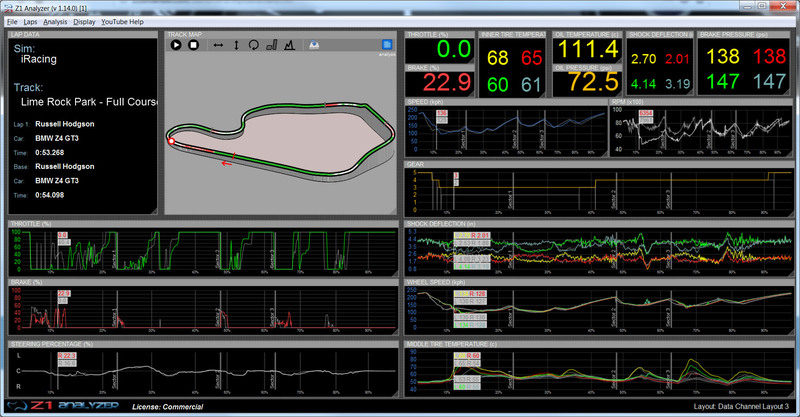 * The Ride Height Analysis screen will now show two laps side by side when you have two laps loaded. * The brake point analysis screen has been improved so that the act of dragging your brakes is not counted as a brake zone. * We have added comments on the overview analysis screen's braking section to include information about whether or not you are dragging your brakes during the lap. * The behavior of selecting drivers from the popup menu in the Select Lap dialog has changed. If you right click on the list of available laps you will see the standard popup menu. Selecting 'Show Drivers' from this popup menu will display the list of all drivers whose laps are displayed in the scroll window. By clicking on the driver name you can choose if you'd like to display that driver's laps or not. This works fine when you have a few drivers. But when you have 10 or more drivers it becomes a two step process to display the laps from just one driver. You have to first select 'No Drivers' from the top of the list, then right click again, go back to the 'Show Driver' sub menu and then choose the driver name. In version 1.15 of the Analyzer if all drivers are displayed, as would be the case when you first choose a sim and track, when you select a driver name the Analyzer will display laps from only that driver, hiding the laps from the other divers. This is a shortcut to get the laps displayed from the desired driver. You can then add other drivers into the mix, or display them all again if you choose. * The above behavior changes have also been implemented when you select from the list of cars in the drop down menu. 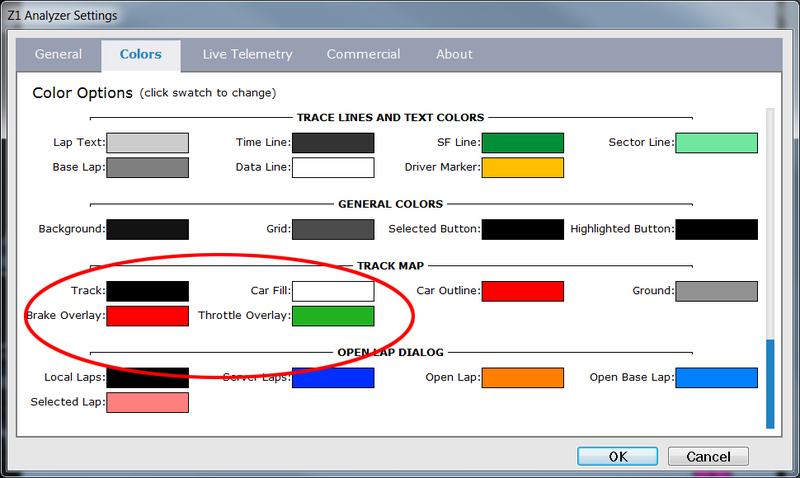 * You can now specify the colors used to display the throttle and brake overlays on the track maps. These colors can be set in the Colors tab of the settings dialog. They are located near the bottom (scroll down) under the Track Map section and are called 'Brake Overlay' and 'Throttle Overlay'. * Drawing the sector line on the various analysis screen track maps has been improved to have the lines better meet the track edges. * The S/F line on the analysis screen track maps has been updated to be a checked flag pattern instead of a red rectangle when the throttle/brake overlay is displayed to avoid confusion with the default braking color. * We've added more YouTube video links to the YouTube Help menu. Please check these out to get the most out of the Analyzer and its features. * The status bar at the bottom of the screen now also displays the driver name, car and lap time for the currently loaded laps. This makes it possible to see that data when the Lap Data window is not displayed. 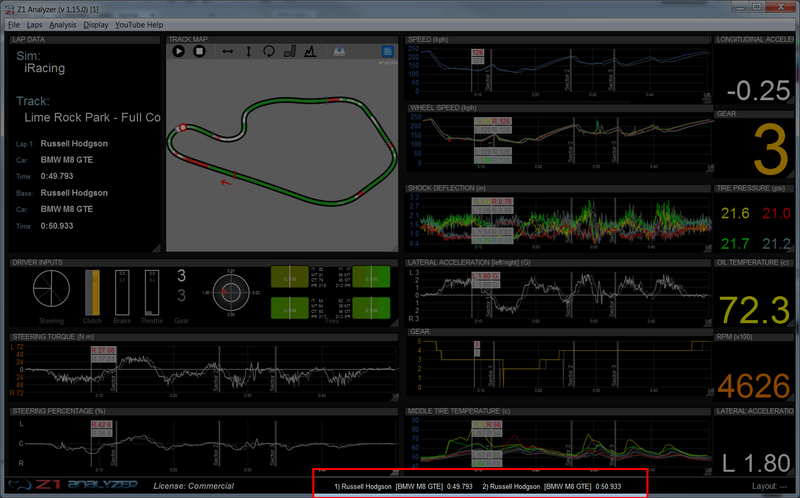 * Instructions on how to make sure you have a track map in live telemetry are now displayed if they are needed. This would be when you are seeing the default square track map. * Compatible with the updated RaceRoom API. Note this update is not backwards compatible with the older RaceRoom API. * Implemented alpha version of live telemetry to F1 2018. Note as this is a beta feature there may be bugs with connecting to F1 2018 at this time. Version 4.18.0 of the Z1 Dashboard is now available! This latest version adds 8 new dashboards as well as updating some of the previous dashboards to include more information. Track maps can now display the track temperature. It is compatible with the newest RaceRoom API. This new API adds a lot of new data channels, and both the Z1 Dashboard and Z1 Analyzer make full use of this new data. We've added a 'sim time' option which replaces the real world time with the time within the sim when that information is available. And you can now choose between 12 and 24 hour time displays. The Weather Dash can now display the sim time. 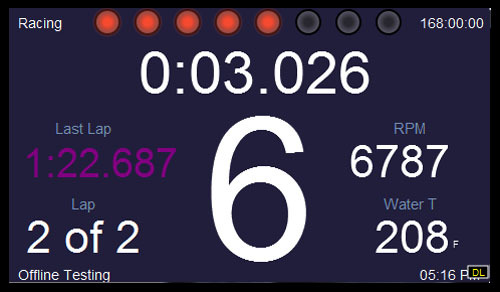 * Added six new dashboards: Indy Car 2019 Short Oval Qual, Indy Car 2019 Short Oval Race, Indy Car 2019 Speedway Qual, Indy Car 2019 Speedway Race, Indy Car 2019 Road Qual, Indy Car 2019 Road Race. * Added new GT3 Dash #5. This is intended for cars like the BMW M8 GT car. * Added new Position And Fuel dash. 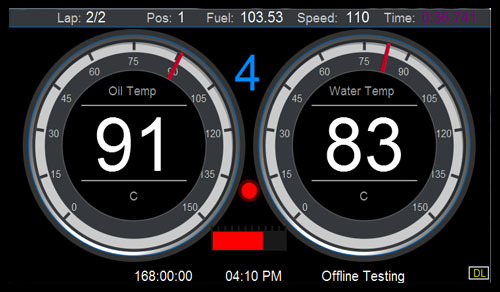 This displays lap, position and fuel information in a large easy to read format. * We are now reading the car numbers from iRacing and RaceRoom for each car. This new information will be displayed on various dashboards. * The Porsche 919 dashboards now display the actual percentage number of the ERS level and amount used per lap underneath the bars. This makes it easier to know the exact amount of ERS usage at any one time. * The Z1 Server now supports the new weather types introduced in previous versions of the Z1 Dashboard. This provides for 7 different weather types including rain and storms. * The track maps have been updated to include the average track temperature in the top right corner. The two exceptions to this are track maps 6 and 7. They do not include this data because it is already displayed in the weather section of their displays. 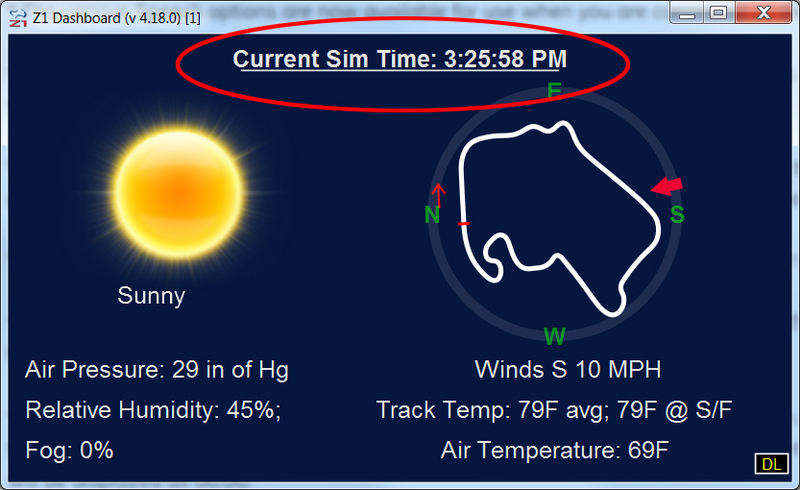 * The Weather Dash will now display the time within the sim at the top of the dash, if the sim supplies that information. 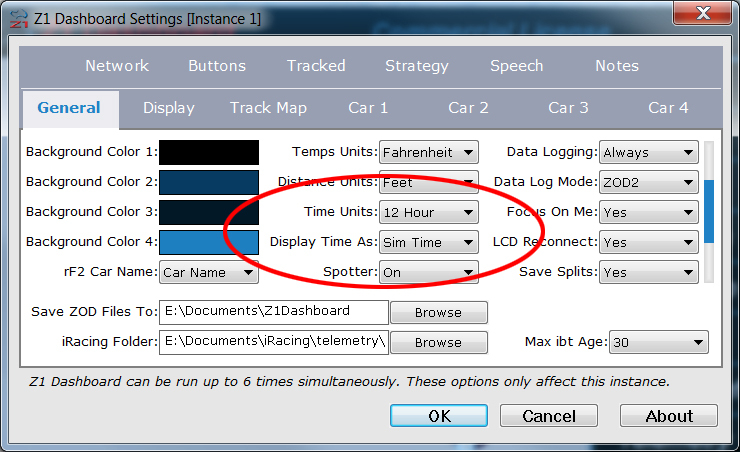 * There is now an option in the General tab of the settings dialog called 'Time Units'. This lets you choose if time is displayed in a 24 hour or 12 hour format. * There is now an option in the General tab of the settings dialog called 'Display Time As'. This determines if the time within the sim, or the actual time in real life, is displayed in the various clocks throughout the Z1 Dashboard. Note not all sims support sim time. If they do not then the sim time will be displayed as 00:00. * There is a new Delta type for Race Room. If you select 'RaceRoom' as the delta type then the Z1 software will use the delta timing supplied by RaceRoom when using that sim. * The Z1 Server has been updated to include the Speech button options and the start/stop sim race button option. * The Z1 Dashboard now creates an entry for a newly driven car the first time you get in that car. Previously you had to open the settings dialog while being in the car in the garage. This caused issues for some sims, like Project Cars, Assetto Corsa or RaceRoom where you might not actually be in the garage. This meant that the car would never show up on the list of available cars in the Car 1 tab, so you could not assign dashboards to it. This new way will make sure the cars are included in the drop down on the Car 1 tab regardless of if you were in the garage or not. This video is an update to one we made about two years ago. A lot has changed in the Z1 Analyzer in that time. A new video was needed - and here it is! The display of the Z1 Analyzer is highly customizable, and knowing how to take advantage of that customization and the information it provides you is really important when it comes to getting the most out of the Z1 Analyzer, and in the end becoming a faster driver - and that is what it is all about. Braking into a turn - a critical part of getting a great lap time. This video explains how the Z1 Analyzer details each braking zone for you so you can improve and beat the competition. When you are driving on a track you always hear people say 'make sure you drive the line'. And 'Hit the apex and track out points'. Well what does that mean? How do you know if you are driving the correct line? Or if you are hitting the apex? 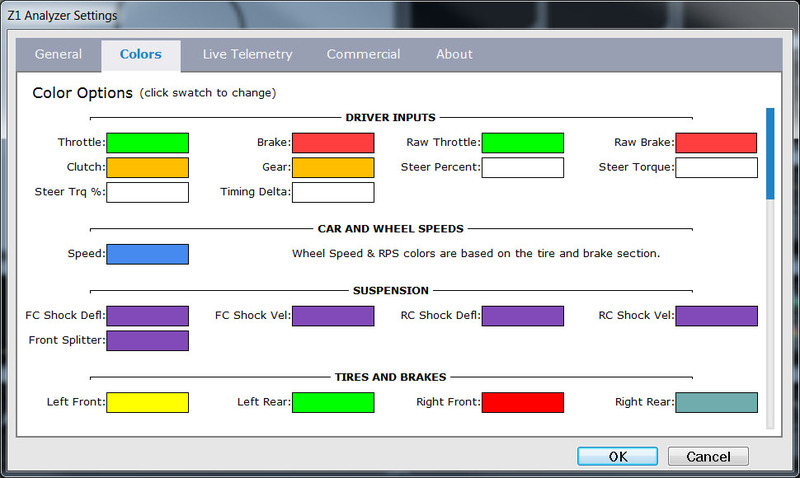 The Z1 Analyzer's Driving Line analysis screen is designed to help you answer those questions. Watch this video to get these answers on one of the best ways to improve your lap times. Version 4.17.1 of the Z1 Dashboard is now available. This fixes a few issues. * Fixed a bug with the Acura HPD dash where if you changed an in-car setting such as brake bias, after the dashboard displayed the new value of that setting, the white background could remain on the right side or the bottom of the Acura dash once it was re-displayed. * Added debug option for adding cars to the list of cars in the drop down in the Car 1 tab ['Car Assignment']. This can help with debugging issues associated with cars not showing up in that drop down after they have been driven. * Added a new option called 'DRS Mode' to the Car 1 tab. This is a car-specific assignment that lets you decide how the DRS should function. You can choose 'Standard'. This would be for F1 cars. Choose 'Simple' for cars where the DRS is either open or not and the number of times it has opened is counted (as in iRacing's Formula Renault 3.5). 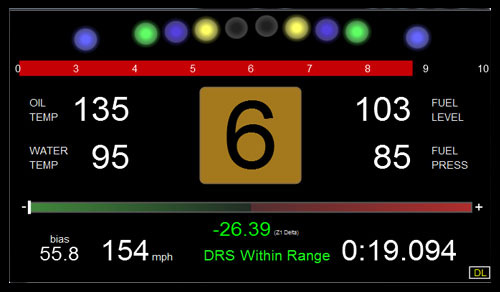 Choose 'Counting' for cars where you want the number of times the DRS has been deployed to be counted, but the sim does not provide this data. One of the main goals of the Z1 Analyzer is to help you improve as a driver. This video is the first in a series that explains the features of the Z1 Analyzer that help you become the best river you can be. Getting the most from yourself as a driver and being consistent every lap is the key to winning races. The Lap Overview screen gives you a summary of how you did driving your lap. It is a must for any driver looking to improve the most important part of the car setup - the driver. One of the great aspects of the Z1 Dashboard software is that it can notify you of various situations on track, or with your car. This is done through changing the background color of the dashboard when one of these events occurs. With version 4.17 there are 7 different notifications that can be communicated this way. For everyone who uses the Z1 Analyzer to help them improve their lap times we have updated the page showing which data channels are available for which sims. As the Z1 Analyzer now supports Codemasters F1 2018 sim, the page needed to be updated. In addition we had added a few additional data channels to some other sims. The latest version of the Z1 Dashboard, version 4.17 includes 9 new dashboards. These are the Formula Dash 3 and 4 series, the GT3 Dash 4 series and the Super Speedway Dash 3 and 4. Here is a preview of these dashboards. With the release of the latest versions of the Dashboard, Analyzer and Server we made some big changes to the UDP stream that is sent by the Z1 Server. As the number of data points that need to be transferred has grown over the years it was time to clean up the structure to use the bandwidth more efficiently. Anyone who is using the Z1 Server UDP feed in their own applications will have to update it to this latest spec. Version 1.14 of the Z1 Analyzer is now available! We've added an entirely new type of data display called 'Data Channels' This lets you view the value of any data channel in a large easy to read format. The Analyzer is also able to load laps from Codemasters F1 2018 that were recorded in the Z1 Dashboard. We've also revamped the colors tab making it much easier to find and change the colors you want. This along with a new title bar position makes the Analyzer's display much more customizable. * Added a new setting called 'Title On Top'. When this is turned on the titles for each trace will be displayed on the top of the trace, as opposed to the left side as was the case in previous versions. This allows for a longer description of the trace being displayed. This option is turned on by default. If you would prefer the titles on the left as in previous versions then uncheck this option. * Updated the Analyzer to work with the new more compressed UDP format from the Z1 Server. * The 'Trace Display' main menu has been renamed 'Display'. * Added 'Data Channels'. A data channel is a small numerical display of any of the available data channels within the Z1 Analyzer. It will display the current value of the selected item. For example displaying Throttle will give you a number between 0 and 100. Displaying Speed will give you a number between zero and your maximum speed. Data channels that are assigned to wheel or tire data will display four numbers, one for each wheel or tire. The number display is associated with the current location selected in the track. 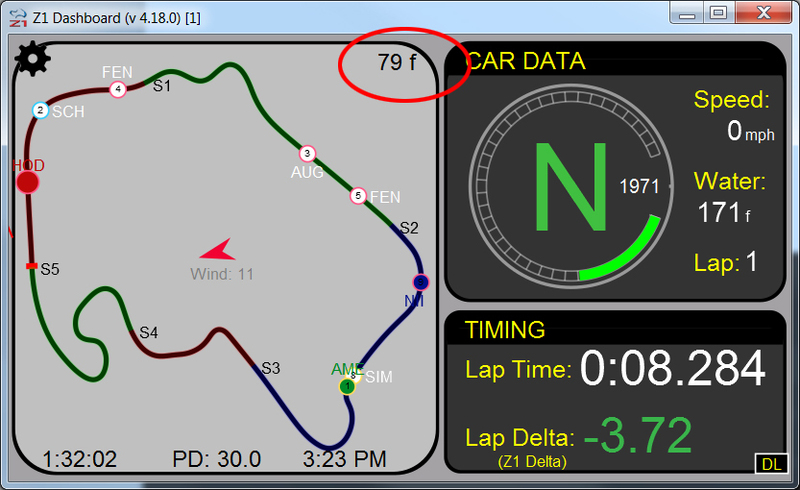 If you are playing back a lap, or viewing live telemetry then the number displayed is the current location on track. You create a data channel display by selecting 'Add Data Channel' from the Display main menu, or type the CTRL-D key combination. Once displayed you can move and resize the data channel just like you would any other trace. To change what is displayed in the data channel, right click on it and choose the desired option. You can maximize the data channel display if you want. To remove the data channel, select the Trace Display->Hide Trace from the popup menu. You can have a maximum of 20 data channels displayed at one time. The currently displayed data channels will also be included under the Display menu. If you select the data channel from the menu if will bring it to the front, covering any items behind it, assuming you have the auto bring to front option selected. Note custom traces are not yet supported in the data channels. 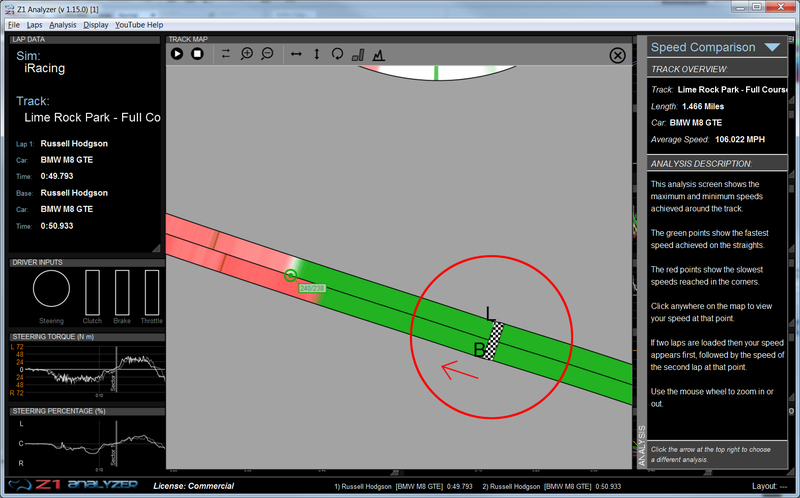 * When choosing the Display->Reset Display option any active Data Channels will be moved to the right side of the window, and be moved to the foreground on top of any traces. * To remove a data channel from the display, right click on the data channel's display and select Trace Display->Hide Trace. Unlike traces, the data channels are not just hidden, they are removed. So the number of data channels will go up and down depending on how many you have displayed. Remember the maximum number that can be displayed at once is 20. * Now when you use the Display menu to show/hide a trace, when the selected trace is requested to be shown, it will also be brought to the front layer (assuming you have the auto bring to front option selected). * The Colors tab has been revamped. The various colors are now grouped into sections based on their purpose. These sections are loosely based on the right-click popup menu displayed in the traces. In addition, several new customizable colors have been added. 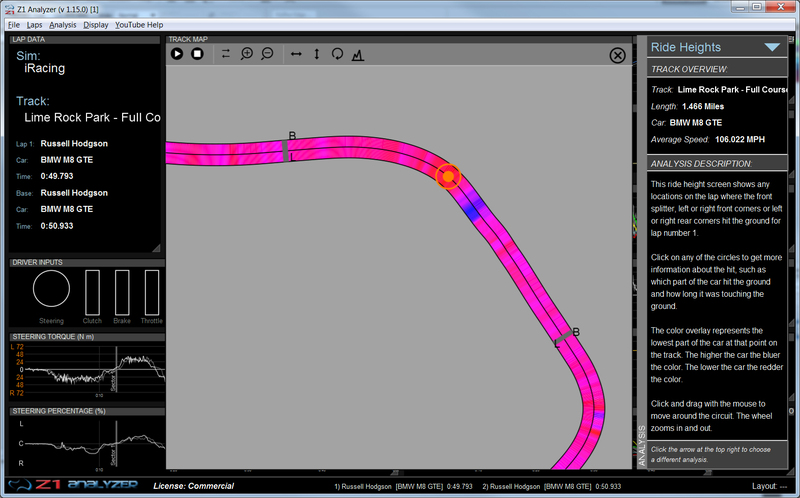 These include those for the trace title background, border, text and header color; various track map colors, and default grid and background colors. * Engine Torque is now available as a data channel for those sims that support it (Currently rFactor 2 and Project Cars 2). * Logging has been updated to include more data when necessary. This should make determining issues easier in the future. * Now when you change what a trace or data channel is displaying (by using the right click popup menu on the trace or data channel) the Analyzer no longer resets the lap position back to the beginning or stops play back of a lap. It will keep everything as it was, and just change what is displayed in the trace or data channel. * The Analyzer can now read laps the Z1 Dashboard recorded in Codemasters F1 2018. Version 4.17 of the Z1 Dashboard is now available! As always we've got lots of improvements, new features and new dashboards. 1) The Z1 Dashboard is now compatible with Codemasters F1 2018 sim. 3) New, improved UDP format used with the Z1 Server. 4) New options for how rFactor 2 car names are read. 5) More data points are read from several of the sims. 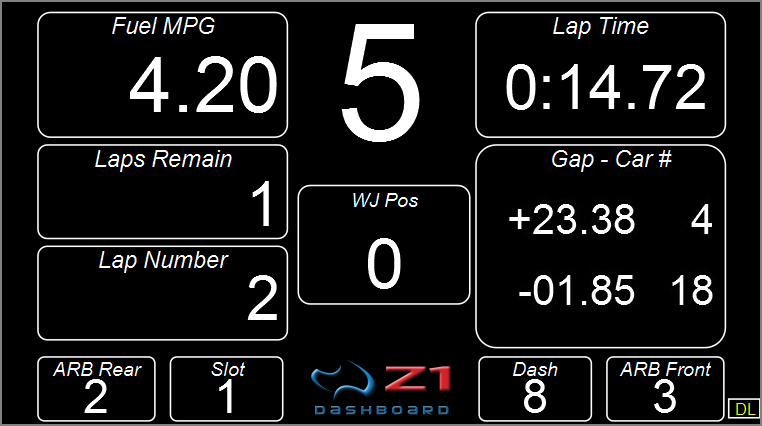 * Added two new dashboards, GT3 Dash 4A and GT3 Dash 4B. 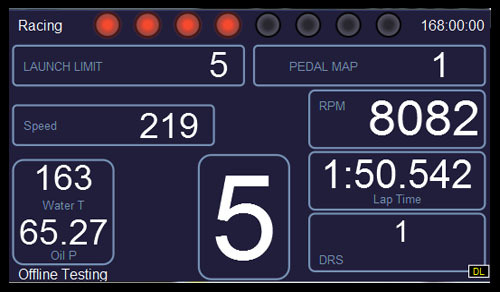 * Added two new dashboards, Super Speedway Dash 3 and Super Speedway Dash 4. 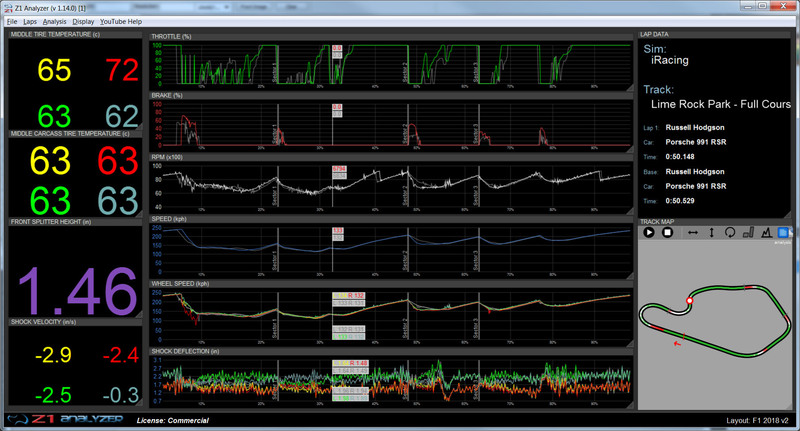 * Added three new dashboards, Formula Dash 3A, Formula Dash 3B and Formula Dash 3C. 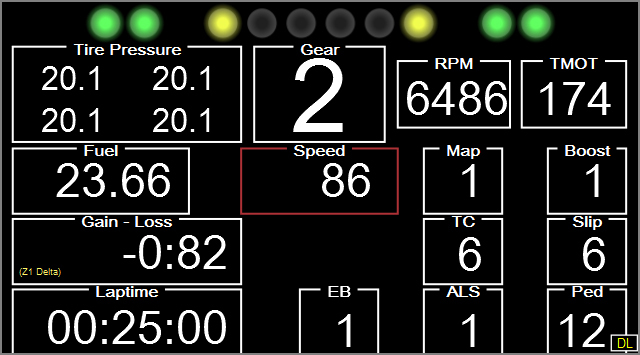 * Added two new dashboards, Formula Dash 4A and Formula Dash 4B. * The Z1 Dashboard is now compatible with Codemasters F1 2018 sim. F1 2018 uses UDP to send data. To turn it on within the sim go to 'Game Options', then 'Settings', then 'Telemetry Settings'. Then set 'UDP Telemetry' to 'On'. Leave the IP address and port as the default. Set the UDP Format to '2018'. You will need to experiment with the UDP Send rate to get the one that works best for you. 30Hz seemed to work quite well during testing. Set 'D-Box', 'Fanatec LED', and 'SLIPro LED' to 'Off', if you are not using those devices. Then within the Z1 Dashboard, open the Settings Dialog and click on the Network tab. Make sure the Codemasters checkbox is ticked, and choose 'F1 2018' from the drop down. If you have selectded Broadcast mode from the F1 2018 telemetry settings, then select 'F1 2018 BC'. * The way in which the backgrounds of the track maps are displayed has been changed. The background color of the section of the track map that is showing the actual map is determined by the Ground Color selected in the Track Map tab. The Background Color selected in the Car 2 tab controls the background of the rest of the track map dashboard. The one exception is Track Map Dash 4. For this dash, the background color is used for the entire dashboard, and the Ground Color has no effect. * The UDP packets sent from the Server to the Dashboard have been optimized allowing them to be smaller. This means less bandwidth is needed to send the data across the networks. It also paves the way for some new features currently in development. * Camber is now being read from Assetto Corsa. * Brake bias and Engine Torque is now read from rFactor 2. You will need to update the rFactor 2 plug. * Engine Torque is now read from Project Cars 2. * There is a new option for rFactor 2 users. 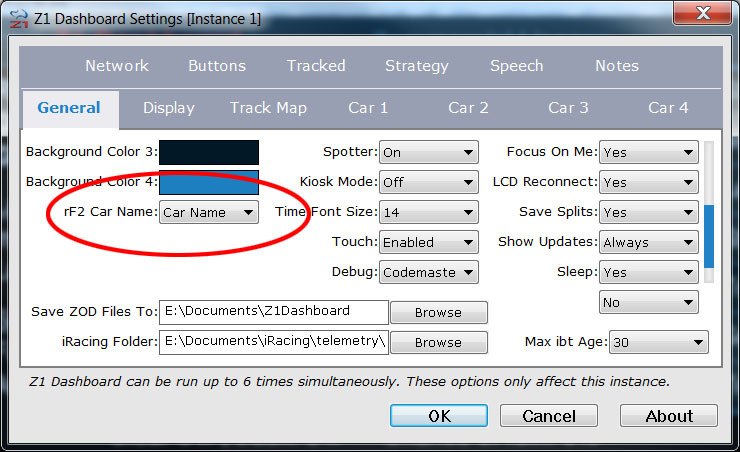 It is called 'rF2 Car Name' and is located in the General tab of the settings dialog. Scroll down and you'll see it underneath the Background Color 4 on the left. rFactor 2 allows cars to have both a car name and a car class. Depending on who creates the car the car name may be very specific and include a car number. For example 'Skip Barber #1'. In these cases the car class is usually similar to 'Skip Barber'. Now there are other cases where the car name may be '911 RSR GTE', and the car class may be very generic such as 'GTE'. The Z1 Dashboard determines which dashboards to load based on the car name. If you have a car name that includes the car number then if you change the car number you'll have to recreate all your dashboards and settings for that car because the car will change from 'Skip Barber #1' to 'Skip Barber #2' for example. Obviously this which would be quite annoying. In these cases it would be better to use the car class to describe the car, as that would remain constant with 'Skip Barber'. Now, if you have a car with a very generic car class, like 'GTE', then it would be better to use the car name to describe the car to avoid having the same dashboard settings loaded for completely different cars, like a 911 and a Ferrari. Because while those cars are in the same class, they would have very different dashboards. This new 'rF2 Car Name' setting allows you to choose how you want the Z1 Dashboard to identify the car being used - either by its name or by its class. Note that the selection you make will also determine how that car is displayed in the Z1 Analyzer when it reads telemetry data. Finally, the standings displays will always use the car name, and not the car class to show which cars are driven by each player. * Expanded the DISPLAY debug setting to include data in creation of background layers used in dashboards. This is intended to help determine issues that occasionally arise with those layers not being rendered. * There is now an option to have the background of the dashboard flash a specific color when the fuel level is below a desired amount. This is set on a car by car basis. In the Car 1 tab there is a settings called 'Fuel Flash'. When on, the background will flash if the fuel is below 7 liters. This setting is on by default. In the Car 2 tab there is a new color swatch for 'Fuel Level Color'. This is the color the background will flash when this option is enabled, and is set on the dashboard by dashboard basis. And in the Car 2 tab under the warnings section, the Fuel Level is the level below which the background will being to flash. This is set to 7 liters by default. Note during qualifying sessions this feature is disabled. With the introduction of the above background flash there are now 7 different scenarios in which the background will flash. They are in order of precedence: Hitting the rev limiter; Yellow flag; Local yellow flag; Blue flag; Pit limiter engaged; In pit lane; Low fuel warning. If two warnings are present at the same time, then the one with higher precedence will be displayed. * Graphical updates to various dashboards. * The weather dashboard has been updated to show more weather options. You can now see icons for sunny, light cloud, heavy cloud, overcast, light rain, heavy rain, and stormy weather conditions. 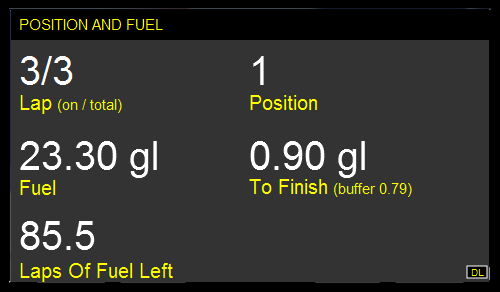 * The fuel level warning amount can now be specified as a decimal amount. Previously it had to be a whole number.